In a medium bowl, add a few pinches of salt and pepper. Add about 2 Tbs of fresh orange juice (or lemon, vinegar, etc). Slowly whisk in about 4-6 Tbs extra virgin olive oil until dressing is emulsified. Cut the tomatoes in to halves or quarters, depending on the size of the tomato. Slice about 8 basil leaves into long, thin strips. 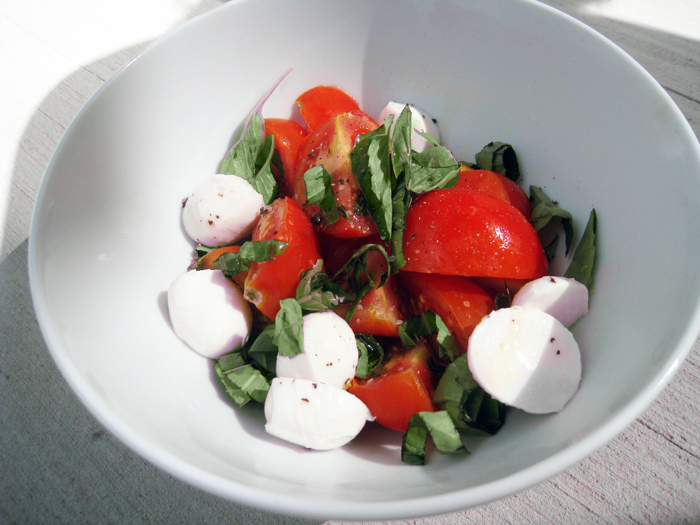 Cut the mozzarella balls into halves or quarters. Drizzle with vinaigrette and toss to coat (you may not need all the dressing — save for later!). Health Notes: Tomatoes are amazing! They are hydrating, low in calories, and provide fiber. They also contain many essential vitamins, minerals, and antioxidants that do everything from keeping your blood sugar in check to preventing cancer!